Lovely, quiet setting surrounded by flowers. 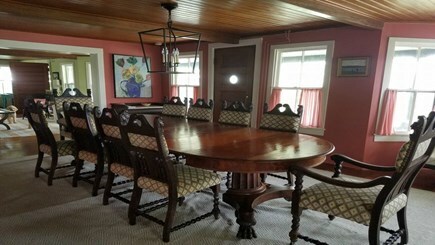 Porch dining set for 10. Always a slight sea breeze and no bugs! 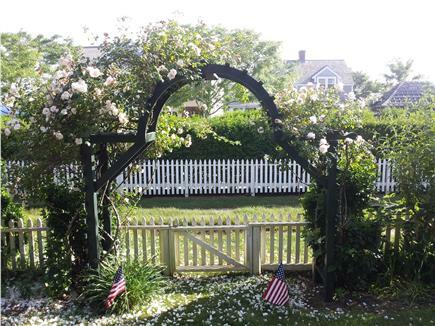 Front rose-covered gate, opens to grass lane to beach. New professional kitchen with 6 burner Wolf range. 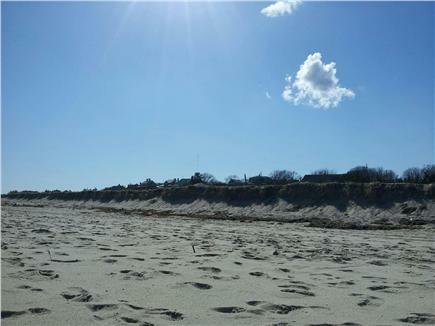 Sconset beach is just steps away. 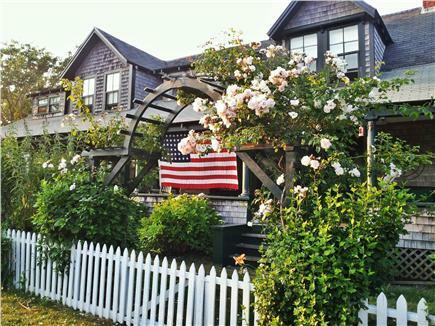 This iconic 19th century landmark summer home is located in the heart of historic 'Sconset'. Brand new professional kitchen with 6 burner Wolf gas range and five new baths (3 full baths and 2 half baths). Air Conditioners in 6 bedrooms. 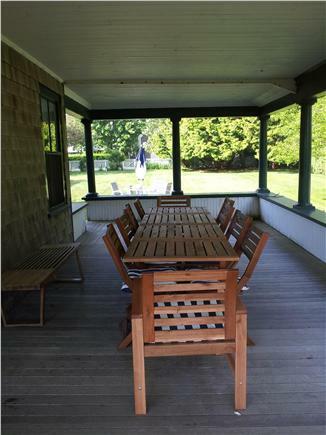 Enjoy a large wrap-around porch and large yard, with a very short walk to the beach and three top restaurants (Chanticleer, Summer House, 'Sconset Cafe). 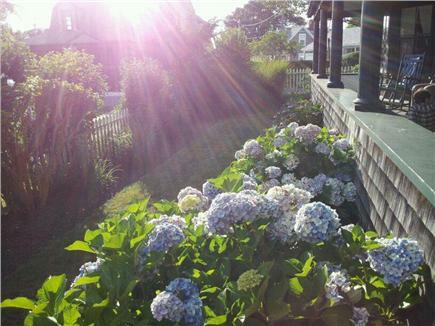 Ocean views from the porch, there is always a lovely breeze. Indoor and outdoor dining for 10. Outdoor shower. With a grass lane in front of the house, the house provides privacy and peace and quiet, yet is very centrally located. 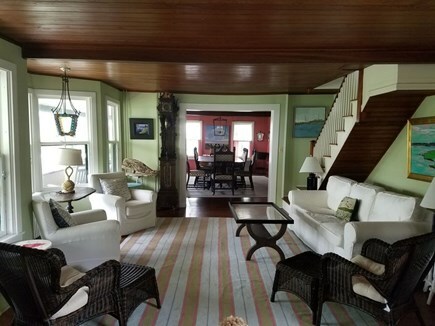 Ideal for families and those who want to experience an old-fashioned summer vacation in a home loaded with character, yet with all of the modern day conveniences. There is simply no other house like this one. 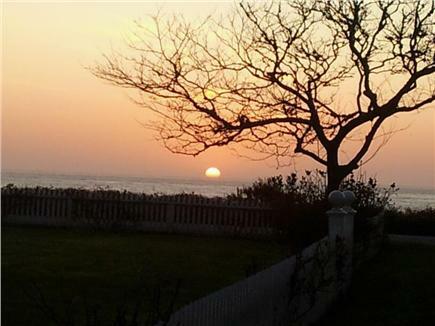 It is considered one of the last coveted historic gems on the island! I’ve had the pleasure of staying at this home twice before the updates to the kitchen and bathroom. 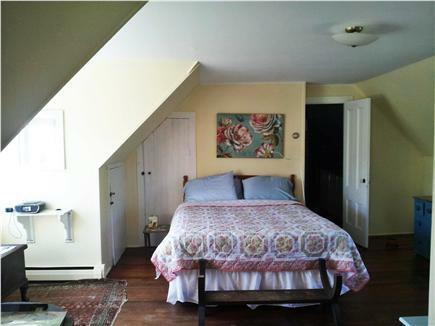 It is lovingly comfortable and beautifully appointed inside and out. The historic nature of the home is real. When you are there, you can imagine the cocktail parties that probably took place on the veranda 100 years ago. There are bikes and beach chairs. It is a quick and easy few minute walk to a great beach and little town with water views on one side, more beautiful homes on the other, wild and manicured flowers everywhere and the scent of honeysuckles in the air. The cliff walk is a great way to spend time every day featuring more of the same. Bike to Sankaty Head lighthouse for more still. Bring a little money. You are likely to ride past lemonade stands along the way. Easy ride into town via car or bus for a change of pace from this more mellow part of the island. My friends and I love this place. Perfect for a small group get-togethers. We had an amazing week at Davy Jones's Locker -- just a short walk to one of the best beaches on the island. Loved the wrap-around porch, always a nice breeze (see the map for location). The home is truly historic with a great yard. 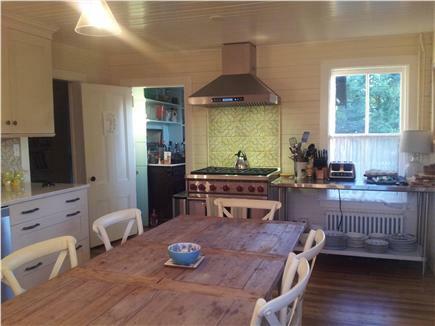 The home was built at a classic time for the island. I already have our week reserved for next year. Can't wait.